All-laminate versions of our durable aluminum framed consoles. Able to support sort modules as well as mailing machine equipment. Variations include open frame, cabinet, corner and counter consoles. Components are all-laminate construction with no aluminum extrusions. 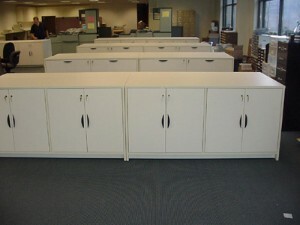 Consoles- features standard consoles (EMT), corner consoles (EMT), counter consoles (EC) and credenza consoles (EMC). Standard consoles are available with optional full depth shelf (EMS) as well as optional half leg or full modesty panel. Consoles and credenzas feature widths specifically sized to support sort modules in addition to overhead units. Consoles feature widths from 24 to 72, depths of 24 and 30 and heights of 30 (42 for Counter Console). Credenza consoles feature hinged doors and one adjustable shelf per storage section. Credenzas up to 48 wide feature one storage section and two hinged doors, credenzas wider than 48 feature two storage sections and four hinged doors. Optional sliding doors are available on consoles with full depth shelf. Credenzas feature a recessed 3 kickplate and black elliptical handles. All components are available in 10 standard color configurations. Consoles and credenzas feature 10 standard chassis colors and 5 worksurface only colors. Console/Credenza Side Panels: Constructed of 1 thick industrial grade 40-50 lb. sub-straight, doublefaced melamine. Framed by matching 1.5mm PVC edge banding. Console/Credenza Back Panel: Constructed of 1 thick industrial grade 40-50 lb. sub-straight, double-faced melamine. Console/Credenza Worksurface is constructed of 11/16 thick high-pressure laminate (HPL) with industrial grade 40-50 lb. sub-straight, backed with a .027 phenolic backer. All panels are connected with Hafele mini-fix cam hidden fastener system with metal-to-metal connection points. Parts are drilled using a 32mm hole drilling via computer controlled point-to-point machines for insured uniformity and consistency. Consoles are shipped knocked down. Console credenzas are shipped fully assembled.